~ King Cakes. Mine should be here today! The ones with cream cheese filling are incredible. 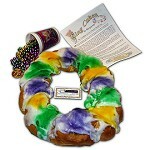 I ordered ours from Marguerite's on the advice of a coworker who is from New Orleans. I may get brave and try out Jessica's recipe. Because they're just too good to only have one. And Lent starts next Wednesday. ~ The bathroom remodel is going well so far. CH came up with the remodel plan by himself; we picked out (and CH bought) the hardware + vanity and cabinets last night. I can't wait to see how it turns out. ~ Spring feels like it's here...but I know better. With spring break a week away, I know we'll have one more bout of winter. ~ I've almost finished watching the first season of "The Event", just in time for the second season to start on Monday. One of the actresses is the daughter of a parishioner, and I had the honor of meeting her after mass a few months ago. Very nice and down to earth. That's my only brush with fame. ~ She's a "percher". She doesn't get on the back of the couch very often, but when she does, it's really sweet. How in the world did I miss the fact that The Event is starting back up? Oh boy...gotta find it on the DVR and set it to record! Thanks, Mary! The plumber comes on Wed to begin dismantling our Master Bath shower...they have to remove dry wall so it should be good and messy. Ugh. She looks so sweet on the sofa. I don't know what that King's Cake is but it sounds good. I am excited for 'The Event' to start back up again on Monday too. LOL - I've been trying to explain to Mei Mei all evening that she is not a cat, and therefore has no need to lay on the back of the couch. Your dog is too funny! I'm definitely going to check out those King Cakes. Thanks. I can't wait to see the bathroom when it's done. those King Cakes sound delicious; anything with cream cheese filling is definitely something to pursue! glad the bathroom remodeling is going well! My stepmom has 2 dogs that sit up on the couch like that. It's hilarious! I have never had a king cake. Apparently, I am missing out?? I thought I was the only one who had a dog percher, might be an epidemic now that I see this! So excited about your new bathroom! How exciting...a new bathroom. Can't wait to see after pics. I have never had King's cake either!